Here's another typo that falls into the not-so-humorous category. 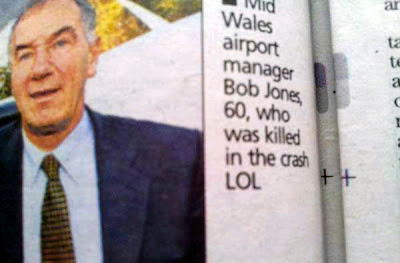 The caption appeared in a recent article in the Welsh tabloid Western Mail about Bob Jones who died earlier this year in a plane crash. I'm guessing, rather generously I think, that the Journalist was either remembering Mr Jones with 'lots of love' or sending the copy to an editor with the same valediction. Either way, it should have been spotted by a Proofreader or Sub-Editor before it went to print. And, in case the Journalist doesn't actually know, LOL stands for Laugh(ing) Out Loud. Or perhaps in this case, Lowest of the Low.